We woke up this morning to twelve inches of snow outside , which means Charlie gets to work from home, and I get to make sure the cats can get in and out of the cat flap. Then it's off to the bakery to make sure we have enough bread and eggs in for these apocalyptic conditions. As soon as we open the door we encounter a man walking an Alaskan Malamute, something very like a Siberien Husky, which seems suspiciously apt for the weather. 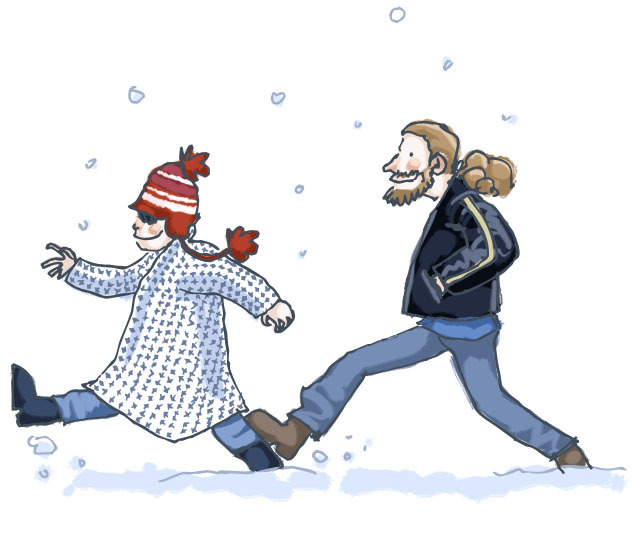 Soon enough, we're stomping around in thick powdery snow, and enjoying it immensely. Snow is always at it's best as soon as it's fallen, and it feels cold and crisp and quiet. All sounds seem to be dampened, and there's a complete lack of traffic apart from the odd tram rumbling past, and even that sounds oddly muffled. Back to the house to put the finishing touches to my children's picture book mock up! It already feels as strong, if not stronger than my favourite book, 'Kitten Kid, Where are You? ', so I'm really excited! Hopefully I can get it sent out to prospective publishers this week! Weather permitting! Yay!